Vanilla Sky might be one of my favourite Cameron Crowe films, although it’s an almost frame by frame remake (or in the words of the director, cover) of Pedro Almodovar’s Open Your Eyes. Crowe even cast the same lead actress for it. But he created such a stylistic and well-directed film, that you can sense his love for the original material in every scene. It’s like customizing your favourite album art… (we’ll talk about that later) … a true labor of love. I actually created all of these custom covers in a rush sometime late last year – after hitting upon the idea of that Bob Dylan reference (#4). I had to get it going before losing momentum, yet especially this very custom cover was the sole reason to postpone this cover series till now. Using a screencap from my old DVD as composition image, I promised my self to revisit this one after Warner had released this year’s official Blu Ray. But unfortunately the image quality hasn’t been improved enough to justify a complete overhaul. So I publish it as it is. After all this tongue-in-cheek design is supposed to represent an old Vinyl record sleeve anyway and I also highly doubt anyone is going to use it for real. Speaking of Vinyl, Classic Records and Vinyl Films released a really nice looking limited pressing on 180-gram virgin vinyl in 2002 (#2) and still I decided to customize it. I’ve found this amazing concept art by storyboard artist Alex Hillkurtz and decided to put it in a Vinyl environment (#3). The aqua band on top was part of the template and the Classic Records logo came together by accident. I selected the wrong blending mode (“Difference”) and suddenly had this ultra-thin outlined version of it. I liked it so much that I deliberately recreated the logo in this style and applied it to the finished artwork. 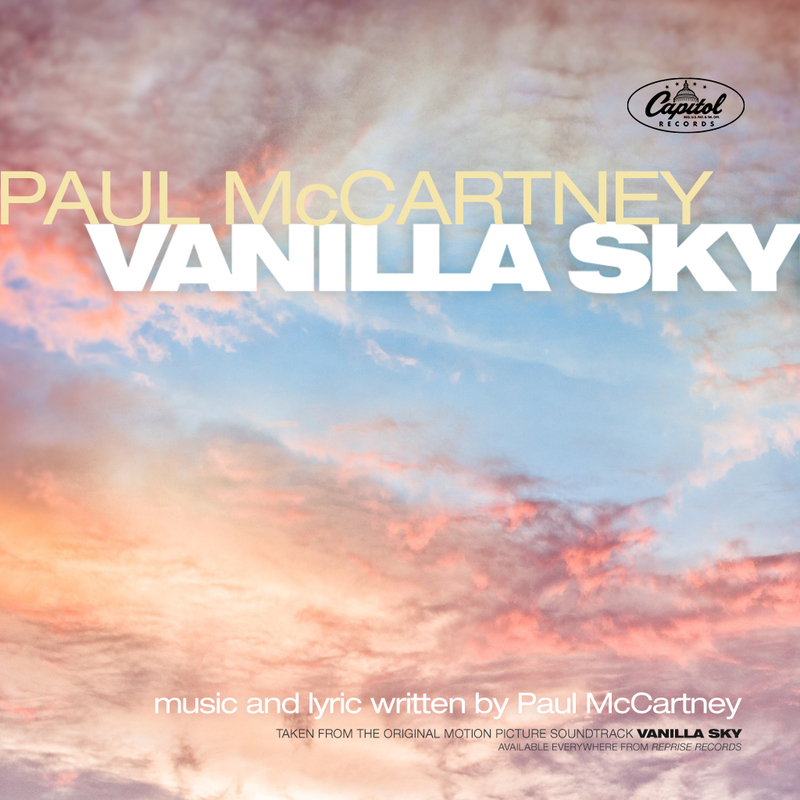 Concluding this series is my version of Paul McCartney’s title song Vanilla Sky, which despite being nominated for an Academy Award, never got a proper single release (#5). I’ve also uploaded an alternate more literal version, which ultimately got scrapped due to contrast issues. Howdy Anakin! The kindly proprietor of Terry’s Eats n’ Dawgs says hello! That “Freewheelin’ Bob Dylan” mashup is the cat’s pajamas pulled up over the bees knees and blown a kiss from Calliope herself. It SHOULD look grainy; it SHOULD look vintage and distressed; and your fidelity to the source and all of its debatable shortcomings are PRECISELY why someone SHOULD use that cover! It’s a GREAT gag and tonally spot-on. Mimicry is difficult and you made it look natural and easy. Don’t just “like” it with reservations; unreservedly LOVE it with all the pride you can muster. On the flip side of that coin, I prefer your alternate to the McCartney single (#5) featured on this page. Since I’m not in your head and don’t know your true intentions for the jacket, I can tell you from my objective point of view that the “contrast issues” on the alternate jacket are working in your favor — great texture, and excellent pastel color just smooth as, well, vanilla… whereas my first impression of the featured jacket was (in order): “Jonathan Livingston Seagull,” or an alternate jacket for “The Sky” by Anita Kerr and Rod McKuen. In my humble opinion, your alternate #5 compliments the production with greater compatibility — she’s already dressed and sitting at home waiting for you to pick her up and take her to the prom. So, I’m advising you fix a corsage to that “sadder but wiser girl,” take her out on the town and show her a good time.